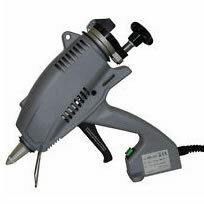 Glue dots and glue dot alternatives, such as glue guns, are used in a variety of industries for general packaging and product assembly and are the latest in non-mess gluing and fastening. They increase productivity as the bond is instant and also eliminates the need for expensive hot melt glue machinery. 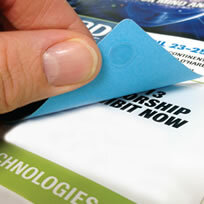 Glue dots or sticky dots are primarily used for attaching items to magazines and other promotional literature as well as labelling, packaging and assembly. They provide an invisible solution with visible results, providing a professional presentation whilst preserving your brand. They can even be used within food areas and even with direct food contact. All glue dots are water clear in colour (except the Super high tack which is light amber), FDA approved and are non-toxic and odourlous. 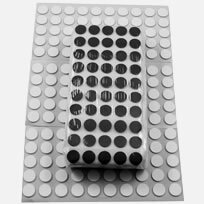 With FDA approval glue dots come in 4 grades of Tak and come in boxes of either 8000, 2000 or 1000 and in the choice of Low Profile, Medium Profile and High Profile. Samples are highly recommended as level of adherance depends entirely on the substrate it is attached to. Glue dots can be dispensed in two ways. A dispenser box – with 8000, 2000 or 1000 dots or a Dot Shot Pro or hand held dispenser (which uses a roll of 1500 or 600 dots). 5-GLUEGMS200, 8200 or the Versashot. 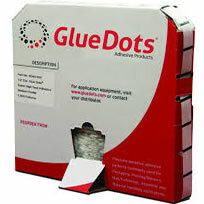 All are ideal for making a large volume glue dots at a fraction of the price of dispenser box glue dots. Simply used, fold down the tabs situated on each side of the box to create your own stand and take the film off the adhesive tabs situated on the bottom of the box which will allow you to fix the box securely to your benchtop. Then pull out the start of the roll and, like a box of stamps, follow the arrows on the box to pull through the strip of glue dots until one is isolated at the top corner of the box (which has been set at an angle to provide an isolation spot for the glue dot). The Dot Shot Pro has been made with a design that allows the dots to be precisely placed individually as well as in a row. It has been constructed of a lightweight impact resistant polycarbonate making it easy to handle. Use is made especially easy as the scrap liner simply rewinds within the dispenser so there is no mess. Low Profile dots come in rolls of 1500, and medium profiles come in rolls of 600. 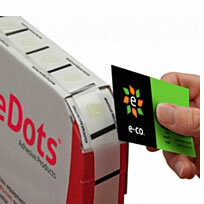 The Econdot is a bench dot dispenser of glue dots. Simply load a roll of glue dots and the Econodot makes the application quick, easy, cost effective and therefore very efficient. It is ideal where high volume glue dot application is required such as in packaging and assembly line. The Econodot simply advances the next glue dot once removed and passes over the photo sensing eye beam. See the video below for further explanation. 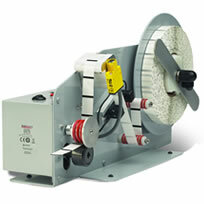 The GTEC8200 is designed to dispense high volume peelable or removable glue dots in custom sizes of your choice. The glue dots can be made of different sizes from 7mm – 30mm using a small piston pump that is operated by a hand lever or with an optional foot pedal. The adhesive glue dot provides a temporary bond of glue used for promotional material similar to preformed glue dots on a roll, but with savings of over 60%. The unit is all electric, so no compressed air is required. 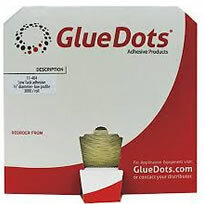 There is a range of alternatives to glue dots that are used for a similar outcome, but where Glue Dots are not strong enough or not specific enough to hold the particular product. Get Packed supplies CD foam dots which are more specific for securing items such as CD's and DVD's onto brochures or cases, as well as CD Supercentres, CD Clips and CD Spiders which are self adhesive clips that a CD clips straight onto. 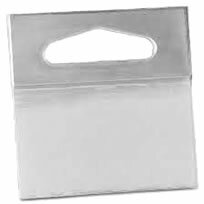 Hang Tabs are also available which are used to convert or repair existing product packaging where merchandising is hung for display. Spray Adhesives are a popular way or bonding for a range of surfaces. Get Packed supply Nashua Permanent Spray adhesives for both lightweight and heavy duty applications. 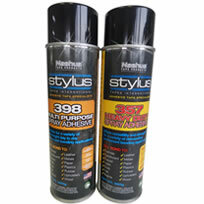 Nashua 357 is a heavy duty spray glue and Nashua 398 is a multipurpose spray glue. Nashua adhesives will adhere to canvas, leather, cardboard, carpet, paper, cloth, rubber, plastics, cork, felt, upholstery, foams, wood and metals. We also supply a 3M brand that is fast drying and also bonds to a range of lightweight materials quickly and without soaking through. CD Dots or foam dots are made from foam and have a self adhesive backing. They are excellent as an alternative to glue dots as they are ideal good for securing CD’s and DVD’s onto brochures, cases, sample cards, flyers as well as presentation packs and stick to most surfaces. They have adhesive only on one side and come in a range of thicknesses and rigidity and are available in either Black or White. CD and DVD Clips are a high quality self adhesive plastic clip which are used to attach a CD or DVD onto promotional material. 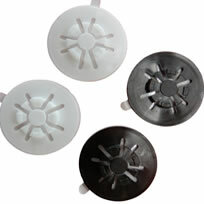 Our range includes PVC CD spiders (pictured) as well as CD clips which allow the user to depress on the inner hub section to release the CD or DVD, as well as the CD Supercentres. All of which are available in either Black, White or Clear and supplied in bags of 1000. The CD and DVD clips are ideal for presentation packs, mailers, brochures and many other CD fixing applications as the high quality self adhesive backing allows them to be applied onto a range of differing surfaces. Hang Tabs are used to convert or repair existing product packaging so that merchandising can be hung for display. Hang tabs are clear in colour and have an adhesive strip on the back so that it can be attached to merchandising. They come in a range of sizes or can be custom cut to a size that suits. Go to the shopping cart to see our list of sizes and for more images. 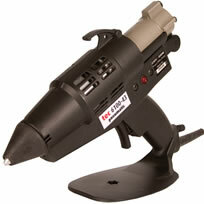 The 5-GLUEGTEC250 Glue Gun is our simplest lightweight, professional glue gun. It is best used where small quantities of adhesive are required in product assembly, packaging and general use. 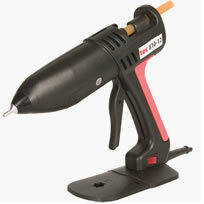 This glue gun has high quality self regulating heater controls and is designed for years of trouble free service. The Cordless Gas Powered Hot Melt Glue Gun is a robust and lightweight gas powered gun that runs on refillable butane gas using standard cigarette lighter cannisters and requires no electricity or batteries. It uses 12mm x 300mm glue sticks and can dispense 1.5kg of hot melt glue per hr (which is approximately 45 x 12mm glue sticks). It takes 15 seconds to refill, easily starts and takes only 5 minnutes to reach operational temperature. It is thermostatically controlled and is designed to use a standard 12mm techbond high performance hot melt glue stick. 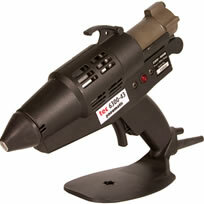 The 5-GLUEGTEC810 glue gun is designed for continuous operation and light to heavy duty use. It is simple yet robust with a highly efficient melt chamber with a powerful 250W stainless steel cartridge heater which ensures an output of 2 kilos of molten adhesive p/hour. Being only 500grams they are ideal for contract packers, printers and assembly lines. This hot melt glue applicator gun features an adjustable temperaure using an adjustable thermostat control and a 'soft feel' full hand trigger with a narrow profile body. The highly efficient melt chamber enables 2.5kg of glue per hour. It requires 240v - 10 amp power and comes with a 3 metre power cord. As it only weighs 500grams it is ideal for contract packers and assembly workers. The 5-GLUEGTEC3200 high output glue gun is loaded with two TECBOND 43mm cartridges which means it never runs out of adhesive – one always remains in the gun ready to go at the right temperature. 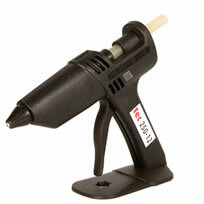 This glue gun is ideal for product assembly, packaging, sealing, electrical potting and encapsulating. The highly efficient heater housing, coupled with a solid state adjustable temperature controller, guarantees adhesive at the right temperature when you need it. 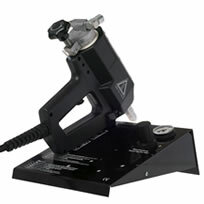 The 5-GLUEGTEC6100 pneumatic glue gun is ideal for the most demanding applications. It is made to a very high standard with 500watt power and offers industry a rugged and reliable production tool at exceptional value for money. This glue gun uses a large 43mm glue cartridge and never runs out as a cartridge always remains in the gun at the right temperature. 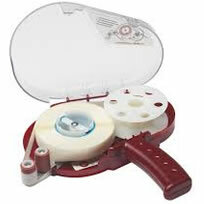 It can dispense up to 4.1Kg's of glue per hour. Reloading takes seconds and is indicated by an audible and visual signal minimizing downtime. The 6300 uses a spray applicator to apply the adhesive. 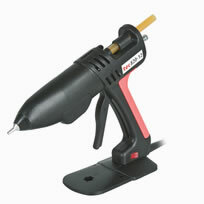 This glue gun is totally self contained requiring only compressed air and electricity to operate. 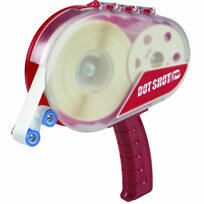 It takes only 10 minutes to heat up from cold and is fast and safe to reload using 43mm adhesive cartridges. It can dispense approximately 4.2Kg's of gleu per hour which is about 68 x 43mm glue slugs. 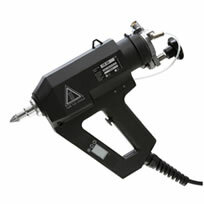 The GPTEC6300 glue gun is the highest output, hand held industrial hot melt spray glue gun available. It is totally solvent free and non-toxic. 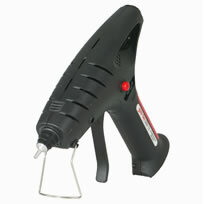 The 5-GLUEGMS200 Reka glue gun lets you process hot-melt in form of 43mm sticks, granulate and pillows. 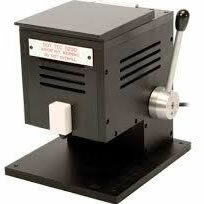 Thanks to its 600 Watts power it is ready to go in 5 minutes and does not require compressed air. The large glue chamber makes filling the capacity of 250ml comfortable and reduces spillage. It has a unique ergonomic shape and an adjustable trigger which enables the user to work comfortably and without fatigue. The Reka MS 200 is suited even for delicate hands and both right and left-handers. In combination with a variety of available nozzles the MS 200 serves almost every application conveniently, flexibly and professionally. 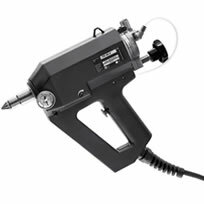 The Reka range of Pneumatic Glue Guns are able to apply hot melt glue in a variety of methods - dots, beads or lines as well as being versatile enough that they can be loaded with hot melt granulate, pillows or slugs. the TR50.4 glue gun has a glue capacity of 250ml, weighs in at only 1.2 Kg and has a thermosat adjustable temperature control which ranges from 20-200 Deg Cel. Being Pneumatic an air compressor is required. Additional nozzels to expand the applications are available. 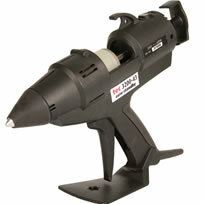 The Reka TR55 Pneumatic Glue Gun is able to apply hot melt glue in a variety of methods - dots, beads or lines. It is also versatile enabling loading of hot melt glues in either granulate, pillows or slugs with either high or low viscocities. The TR55 glue gun has a glue capacity of 330ml, weighs in at only 1.4 Kg and has an electronic temperature regulation - displayed on LCD - which ranges from 20-200 Deg Cel. Being Pneumatic an air compressor is required. Additional nozzles to expand applications are available. Being a spray applicator the TR60 allows for the coverage of larger areas such as is used in pallet stabilisation of cartons or bags. A built in regulator and manometer allows for the correct glue output and spray patterns. Weighing at only 1.2Kg the TR60 features an electronically controlled (LCD Display) temperature which ranges from 20-200 Deg Cel. It also retains flexibility as it can be loaded with either granulate, pillows or 43mm glue slugs in high or low viscocities. The TR60 has a tank capacity of 250mls and being pneumatic it requires an air compressor. Additional nozzles to expand its applications is also available. It comes standard with a stand for storing. Get Packed supplies a wide range of hot melt glue to be used for the full range of glue guns. Hot Melt Glue is made from 100% solid non-toxic adhesive containing no solvents or water. Hot Melt Glue is available in sticks, slugs or pellets. The Glue is heated in the chamber of the Hot Melt Glue Gun to form a liquid adhesive that is extruded through the nozzle of the gun when the trigger is gently squeezed. The molten adhesive is applied to one surface of the product and then pressed tightly together with the item to be attached to form a permanent bond or seal. 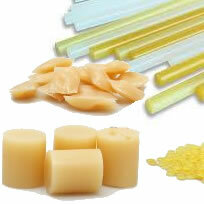 Hot Melt Adhesive is available in many formulation to suit almost any application. 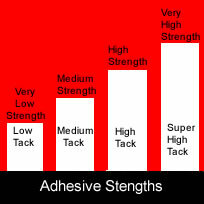 Click on this link for more comprehensive information on the Features and Uses of Hot Melt Glue.